Deep learning enables computational models that are composed of multiple processing layers to learn with multiple levels of abstraction, the representations of data. These methods have resulted in the improvement of the state-of-the-art in object detection, speech recognition, visual object recognition, and many other domains such as drug discovery and genomics dramatically. The system is flexible and can be used to express a variety of algorithms, that includes deep neural network models training as well as inference algorithms, and it has been used for conducting research and for the deployment of machine learning systems into production across more than a dozen areas of computer science and other fields, including the retrieval of information, speech recognition, robotics, computer vision, geographic information extraction, natural language processing, and computational drug discovery. TensorFlow, an open-source project with its main focus on training and inference on deep neural networks. supports a variety of applications. Many services of Google in production make the use of TensorFlow and over time it has become widely used for research in the field of machine learning. This historical survey has a compact summarization of relevant work, much of it from the previous millennium. Shallow as well as deep learners by the depth of their credit assignment paths are distinguished which are chains of possibly learnable, causal links between actions and effects. Here in order to develop a novel artificial agent, termed a deep Q-network, we make the use of recent advances in training deep neural networks that using end-to-end reinforcement learning can learn successful policies directly from high-dimensional sensory inputs. This agent was tested on the challenging domain of classic Atari 2600 games. In this work, you are introduced to a Region Proposal Network (RPN) that shares with the detection network, full-image Convolutional features, thus enabling nearly cost-free region proposals. A Region Proposal Network is a fully Convolutional network that at each position simultaneously predicts object bounds and objectness scores. In contrast to current models which assume a fixed spatio-temporal receptive field or simple temporal averaging for sequential processing, recurrent Convolutional models are “doubly deep” in that they can be compositional in spatial and temporal “layers”. It as easy-to-use MATLAB functions exposes the building blocks of CNN's, providing routines for computing linear convolutions with filter banks, feature pooling, and many more. This document provides a great overview of Convolutional Neural Networks and how they have their implementation in MatConvNet and further also gives in the toolbox of each computational block the technical details of the same. In this work, the main focus is to help bridge the gap between the success of CNN's for supervised learning and unsupervised learning. Here, you are introduced to a class of CNN's called deep convolutional generative adversarial networks (DCGANs), that have certain architectural constraints, and demonstrate that they are a strong candidate for unsupervised learning. There is large consent that successful training of deep networks has a requirement of many annotated training samples. In this paper, you are presented a strategy in network and training that in order to more efficiently use the available annotated samples solely relies on the strong use of data augmentation. 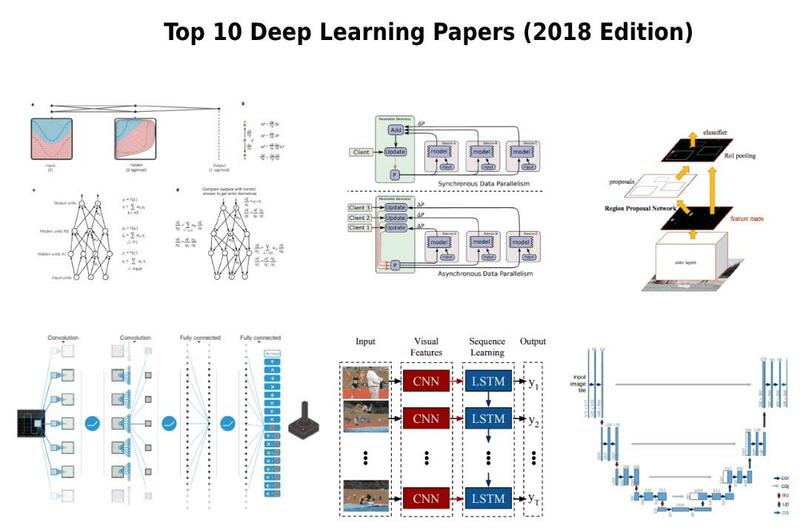 Given above was a list of top ten deep learning papers as an abstract, for more info regarding the same, one can refer the link below each paper.